Serves 1 big dish or 2 smaller dishes. You can freeze it. 75 cl of liquid cooking cream, pref not skimmed ! Heat oven to 180C/fan with a bowl of hot water at the bottom. 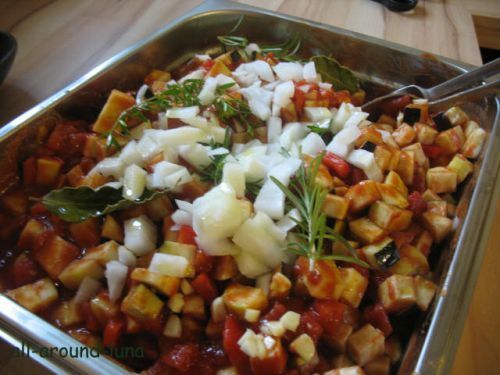 Prepare a large oven dish and add the passata + chopped tomatoes. This will help the rest of your veg not to go brown (antioxydant). Chop all the vegetables into cubes of +/-0.5 cm. Add the rest of the ingredients and stir a bit. Place in the oven and cook for 15 minutes. Then take the dish out, stir andeventually add one or two tb spoons of water. Put back in the oven for 15 minutes. Repeat this up until the vegetables are cooked tender but not dissolving. The preparation must not be dry but moist. - In a very large pot, heat the olive oil with the onion. Wash the spinach, drain it and pour it directly into the pot. Add salt and pepper and stir. Gently cook for 5/10 minutes. Set aside to cool a bit. Then press it in your hands to extract all the juice. Chop thinly. - Pour the cream in a large dish and add the ricotta. Stir firmly so that the ricotta dissolves in it. Add the veg, salt, pepper and nutmeg. Stir delicately. Cover the bottom of your dish with a little bit of olive oil. Start with one layer of roasted veg. Add one layer of dried lasagna. Try not to overlap**. Go on with one layer of creamy veg. Add one layer of dry pasta. Then add one layer of tomato passata + mozzarella. Then one layer of dry pasta…. etc. Go on with what you got left but make sure you finish with something liquid, not dry pasta. If you run out of veg, add simply some cream or some passata on top. Finish with some grated cheese on top. Heat oven to 180C/fan with a bowl of hot water at the bottom and cook for +/- 30 min. **To make lasagna sheets fit your dish, simply break one sheet into bits and use them like a puzzle in the corners. No overlap !